When considering Perth over the last ten years, the Perth Cultural Centre can be seen as a test bed for urban revitalisation strategies in Western Australia; a desolate place blighted by the over-scaled ‘build it and they will come’ strategies of the 80s and 90s mall culture. The James Street precinct had big institutional destinations and heritage buildings steeped in history, but nothing to connect them together. The Metropolitan Redevelopment Authority¹ (MRA), operating as a well resourced pair of garden shears for red tape, rendered the Cultural Centre a ground of architectural experimentation. Architects, landscape architects, artists, placemakers and events organisers were commissioned to ‘revitalise’ the space with temporary and short term projects, bringing to mind Rem Koolhaas’² project Exodus, or Voluntary Prisoners of Architecture by way of Cedric Price’s Fun Palace – a space dedicated to pop culture and mass consumption; the strut that Robert Hughes found lacking in the Modern metropolis³. 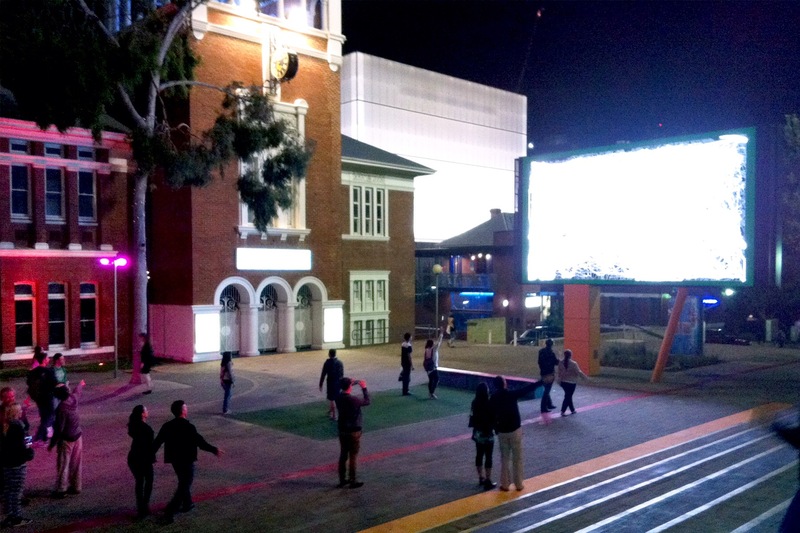 Part of this revitalisation effort was the installation of a large public screen, and during Architecture Week 2014, films made by architects, artists and students from around the world were shown as part of the inaugural Urban Screening. Mimi Cho and Frazer Macfarlane, curators of the Urban Screening, spoke with Phillip Griffiths from Griffiths Architects, who was engaged by the MRA in 2011 to provide architectural services for the LED Screen, and Rob Cameron, who had four works showcased in Urban Screening 2014, about changes in Perth over the last ten years and their work. It has been an interesting period. The [Perth] Cultural Centre was the idea of the City of Perth and was included in the Metropolitan Region Scheme that flowed from the Stephenson and Hepburn Plan of 1955 and implemented by the State Government. Early in its development stages there was a Cultural Centre committee, which was meant to operate as a bridging mechanism for the good of the institutions and their environment. Although the committee consisted of eminent people from the property industry, the arts, the City and statutory bodies, it didn’t have any power or resources to implement its ideas. The last big push from that committee was to invite Denton Corker Marshall to come up with some ideas about how to improve the public domain. The basis of that was recreating James Street as a thoroughfare, and having much more interesting public spaces and better designed urban spaces. It died a death. Then the MRA was given carriage of the Cultural Centre in 2004. The remit included properties on William Street, originally acquired for the Perth Cultural Centre. The MRA is in a unique position of not having to make a profit out of everything, to balance out investment in an overall sense. There was a decision not to spend too much money on the buildings on William Street, just enough to get a different kind of tenant mix, something fresh. Liquor licensing refused a very big offering which has given impetus for smaller and more diverse venues. So once William Street was rolling along, there was an impetus to do something in the Cultural Centre itself. A whole lot of people got involved in landscape, children’s play, brainstorming for some tiny things; most of what we were doing was not meant to be permanent, rather transitional until there’s money to do something major to fulfil an adopted vision. I think after the new museum is done, it will be time to do the permanent fix and enhance the public domain. The first thing to happen to enhance the public domain was painting colours on the steps. Then Jean-Mic Perrine was engaged, an architect and also a builder, who designed and manufactured the concrete pods [which provide minor services]. At the same time Josh Byrne did the Urban Orchard. All these spaces were empty and slightly derelict prior to the project. The Urban Orchard used to be a sculpture court [but] Northbridge was such a poor environment prior to the work that sculptures were being damaged and taken away. Then the idea of the screen came up. I think the MRA were approached to do it – they had one down the other end of James Street in the Northbridge Plaza. There was a lot of coordination, because no one had done one outside of sport stadia and this screen was going to be seen from all sides. A number of people had been engaged to do the bits, so really our problem was, where do we put the screen, how do we service it, where can we have a control room, how do we shroud it? It’s pretty functional; fans, the screen modules and so on – a bracket to hold them on. I couldn’t say there was anyone in control of the whole idea. We [Griffiths Architects] were in control of the screen and the associated parts that went with it, but there were all these other minor projects happening around it. We would go there, see new things happening and think ‘who organised that?’ We were trying to make fist of it, ‘here’s all the bits, what can we make it look like?’ Get some order in it. Part of the reason we could do these things was that no one thought that the existing urban environment had much value as it was. No one thought the public spaces were precious. So that’s what the opportunity was: something we can play around with, and it’s not forever, so let’s not over-invest in it. Some of what’s been done [in the Cultural Centre] is a bit tacky, and requires the ongoing commitment to curating it. The MRA was aware of that at the outset. They knew it would be a small amount of money invested in hardware and a lot of money in sustaining it, so there are no surprises there. It’s just a step along the way. We’ll see something completely different when there’s money again, which isn’t going to be for a long while now. The horizon for this was five to ten years tops, but I can see it still being there in twenty years now. The Final Curtain was a piece of work I did with [WA artist] Jon Tarry as part of an Architectural Visualisation unit I was doing at UWA. He was running a project on the demolition of the Perth Entertainment Centre and we co-directed an animation I produced which explored the nature of the demolition, and of collective memory. It was an interesting thing for me, because I never went to the building – I only saw it from a distance as this abandoned space. In the animation there was his influence, a nostalgic view, and my view of an alien thing. Jon created a Facebook page for people to post images of their experiences, to reminisce about all the good times there, while he posted videos of the demolition. I didn’t feel bad about seeing it blow up [in the animation] – I was separated from it (even though I researched and wrote a piece on it). Seeing it being demolished is a brutal, violent act; these cranes, like dinosaurs biting chunks out of it. It is a strangely beautiful thing to watch it being demolished, almost sublime. [The middle of the animation where the piece shifts from nostalgia] relates to the violence of urban renewal, e´ventrement4. It’s portrayed as healing the city. It’s always a loss to see a part of Perth’s identity disappear especially after all the stories and images [on the Facebook group]. [It was interesting] for me as an outsider, being able to look at the Entertainment Centre without rose-tinted glasses, to see it for what it was and see it for how much value it had as a site of memory rather than as a piece of architecture. At the same time I was working at ARM [Ashton Raggatt McDougall] and actively involved in the design of the building which would replace it. It wasn’t the most impressive building in the city but I had a very strong appreciation for it in the end. Dead Reckoning v2.0 was an opportunity to continue research that I had been doing as part of my studies at UWA. A part of that research was looking into computer vision, and how that can be used to feed into the design process of buildings. The Urban Screening gave me an opportunity to look at the more artistic and aesthetic outcomes of the work – I was learning as I was going. There were a lot of outcomes of the script [computer program] which I didn’t get to explore in detail in my studies at UWA, and this additional work allowed me to fine tune a script I tested the previous year at the MANY 6160 Block Party [October 2013], and think about how I could make it an interactive experience in the urban space, rather than just an analytical tool. That involved making more of the data visible; as people were moving, the script was drawing the contours of their motion so you could physically see silhouettes of them moving around, and at the same time you could see the centre point of each person drawing a trail. A network of paths would layer up over the course of ten minutes like a spider’s web, but then they would fade away and new information would get written over the top. So it was more of a temporal effect; being able to visually represent the form of spatial flows made the experience more interesting. The project in the first place was a proof of concept for the idea of being able to track not only people within a space, but other information as well, and have the environment be able to react, and then have people interact in a way they haven’t been able to previously. My biggest fear was that people wouldn’t interact with or ‘get’ it. The most important question about the work is ‘can you design a piece of architecture that has a sympathetic response with an individual?’ You need that moment of realisation that this thing is communicating with you. Once that happens it is a beautiful moment when there is this conversation between the display and the viewer – people running around try to draw things or happy watching themselves being watched. [During the Urban Screening, Dead Reckoning v2.0] had different life depending on the day of the week. If it was really quiet you’d get a solitary person walking along – they might wave their hands and keep going, or they start performing in the space and suddenly it’s like a taboo’s been broken and it’s OK for everyone to start mucking around. [One day] there were school kids doing cartwheels, flips and jumps, going all over the place – it came alive! Buildings can have a ‘personality’ and communicate without the need for heavy technology but the possibilities for social and cultural change are difficult to ignore. Architecture as a profession has been slow to take on board technologies that are already having major impacts on our experience of urban spaces. My work is focused on experimenting with and interrogating this emerging techno-social environment. Urban Screening is an event that explores the possibilities of architectural thought and production from architects, students, artists and filmmakers in the medium of video. It is a public event which sees architectural ideas inhabiting the city, and being made available to the public in a manner which aims to be sophisticated and thought provoking in its promotion and communication of the importance of architecture’s achievements and possibilities. The curators of Urban Screening 2014 would like to thank all the contributors who made their work available for inclusion, the Perth Cultural Centre Screen curatorial and technical team, the City of Perth, the MRA and the staff at the WA Chapter of the Australian Institute of Architects. For the full list of works and contributors, please visit the project website at http://www.urbanscreening.org. The Architecture Week Urban Screening will return in 2015, email curator@urbanscreening.org to register your interest. ¹ Metropolitan Redevelopment Authority. The precinct was initially under the purview of the East Perth Redevelopment Authority, which after restructuring became the MRA in 2011.